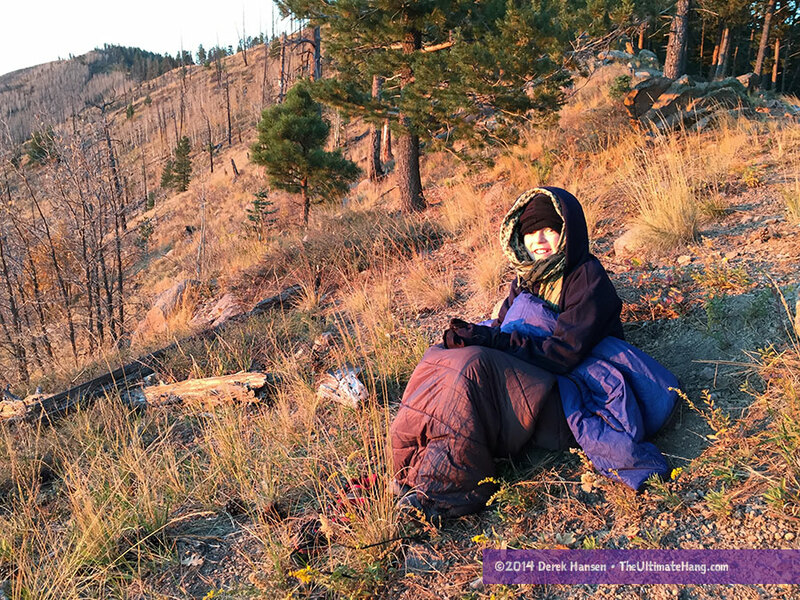 My son wrapped up in the Vesta while I cook breakfast on one of our backpacking trips. Eagles Nest Outfitters (ENO) has continued to build on their line of hammock insulation options with the introduction of the Vesta synthetic top quilt. 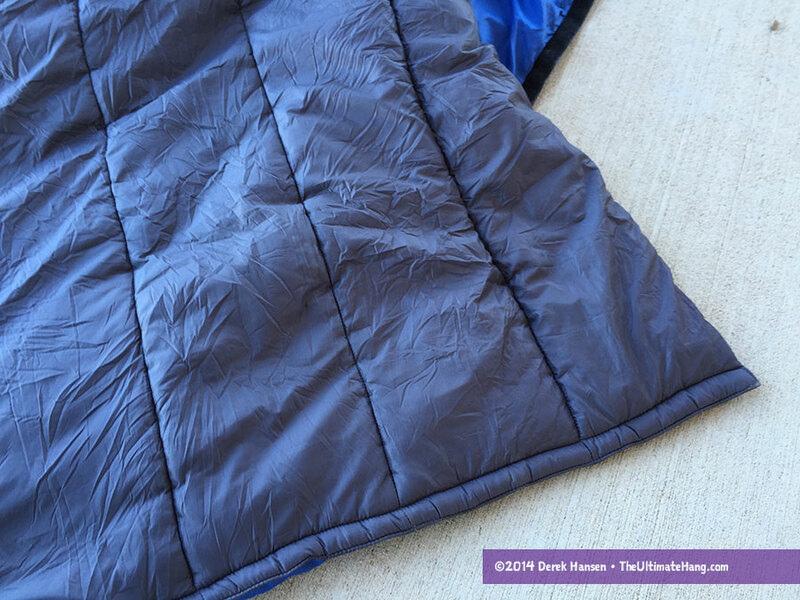 I reviewed their down-filled Blaze under quilt and Ignitor top quilts last year; the Vesta rounds out their synthetic line (the Vulcan is the matching synthetic under quilt). 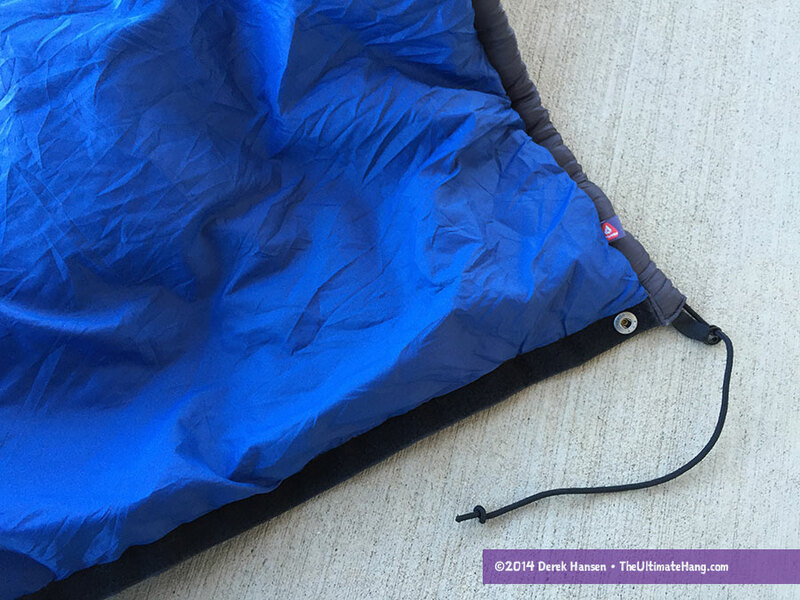 ENO states that the Vesta includes a compression stuff sack, but what I received was just a regular, rounded stuff sack—no compression straps. The build and design of the Vesta top quilt are nearly identical to it’s down-filled cousin, the Ignitor. The continuous filament doesn’t need baffles or quilting, and that is apparent in the inner fabric where there is no quilting or stitching. There is some stitching on the top of the quilt, and I can only guess this is used in part for structure and also for aesthetics. The fabric has a nice smooth hand that isn’t static prone and feels soft. The overall build quality is very good with only a few loose strands and snags apparent. Detail on the foot box, showing the inner fabric, snaps, and hook-and-loop fastener. I was a little disappointed that I couldn’t completely close the foot box. The channel where the cord is threaded has insulation inside, which severely limits how much I can compress the area. Try as I might, I couldn’t completely close the foot box. 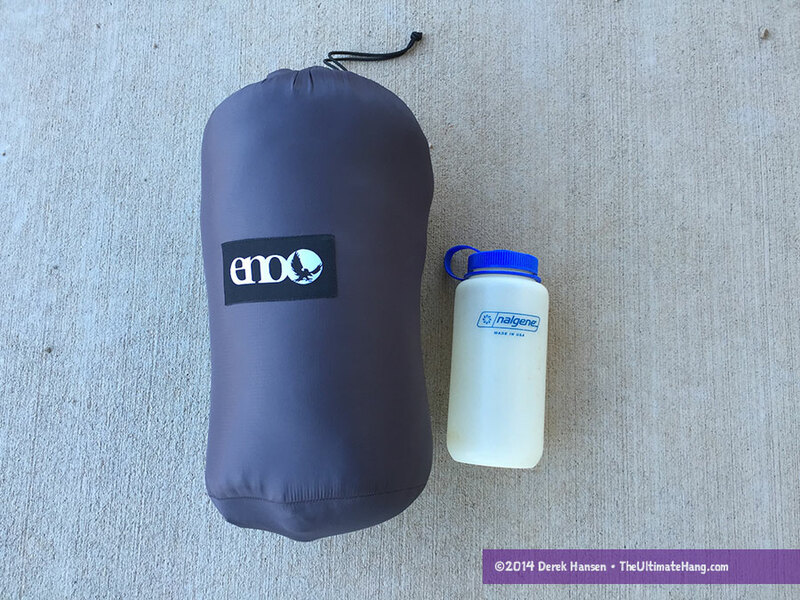 I’m very pleased that ENO included a stuff sack and storage bag. As I mentioned before the stuff sack is generic; it isn’t a compression sack. The fairly useless draft collar. The Vesta also features the strange draft collar I noticed in the Ignitor. It’s brassière (or yoke) shape lays flat against the quilt, so it is hardly any use in the field. The real piece missing was some clasp or connection I could use to close the top of the quilt around my neck and head and then a cinch cord to close up the head end. This is one modification I would make to the quilt for extended use. I’ve taken the Vesta on a few backpacking trips in the late fall in Utah, Texas, and Arizona where overnight temperatures have been in the low- to mid-30s°F (-1 to 2°C) in both dry and slightly humid conditions. 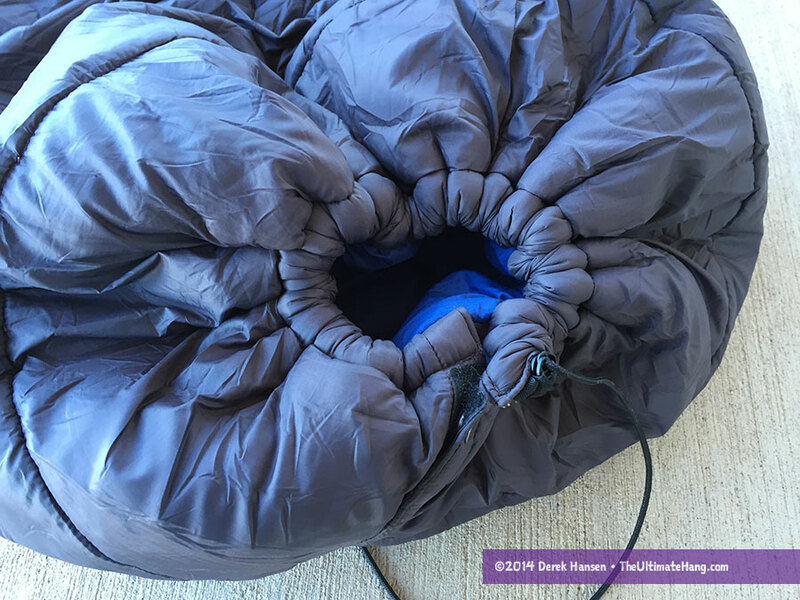 In all cases I wore some insulated pants and jacket and I slept mostly warm the entire night. In one case I actually overheated and had to vent a little. I was very happy with the performance of the insulation. Where I felt cold on a few occasions was when the top of the quilt slipped off a shoulder and I would feel drafts and cold spots. This is where I wished I had some clasp, button, or toggle to tie together the head end and have some cinching mechanism to really close up the head area. The “hole” in the foot box where I couldn’t completely cinch up the end hasn’t been a problem yet. I wore socks to bed and didn’t have any issues with drafts or cold feet. Synthetic insulation doesn’t pack down as small as down, but it gets down to a few liters in volume. I normally pack my quilts without the stuff sacks directly into the bottom of my backpacks so the volume is better filled than with oddly shaped stuff sacks, which leave a lot of empty, unfilled pockets. The storage sack has been a great addition when I haven’t used the quilt. I’ve been pleasantly surprised by the warmth of the quilt. 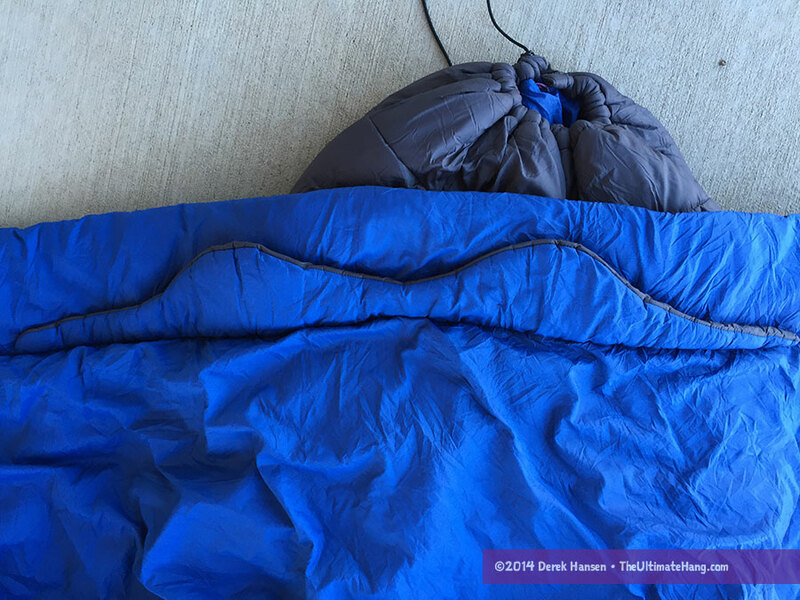 I normally sleep colder in synthetic quilts, so I packed extra insulation during the cold nights. I’ve been comfortable (or too hot) so far. I’m actually a fan of synthetic insulation for clothing because of the moisture control and ease of drying and washing, even in the field. 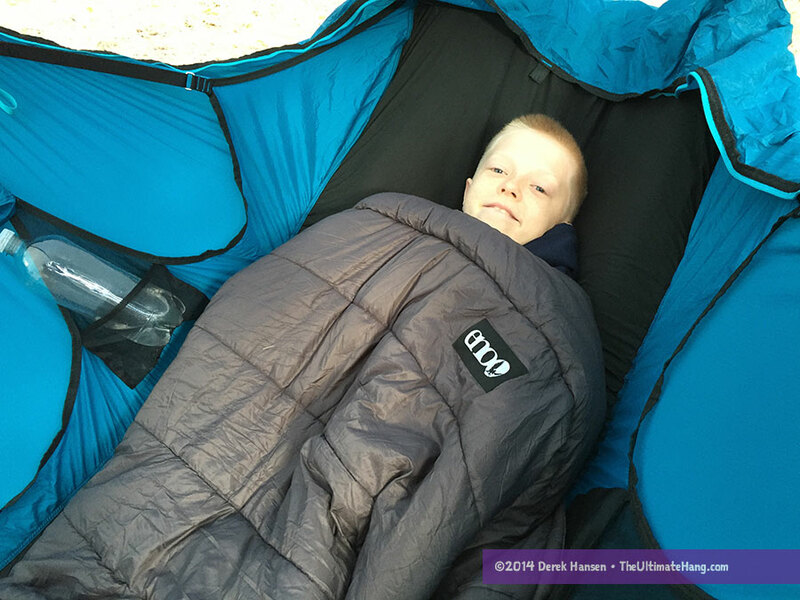 In many areas or circumstances, a synthetic quilt or sleeping bag is actually preferred. Price is another driver for synthetic insulation. I wish the price on the Vesta was lower. The construction and design are basic and the materials cost much less than down, but there is only a $60 price difference between the two. Given that down is warmer and packs down smaller, I’d recommend getting the down version, or look for sales from retailers. What hammock is the blue one? That is the amok draumr. Is this quilt usable in place of a sleeping bag when camping on the ground during the warm summer months? Yes, but you’ll still need a good pad.